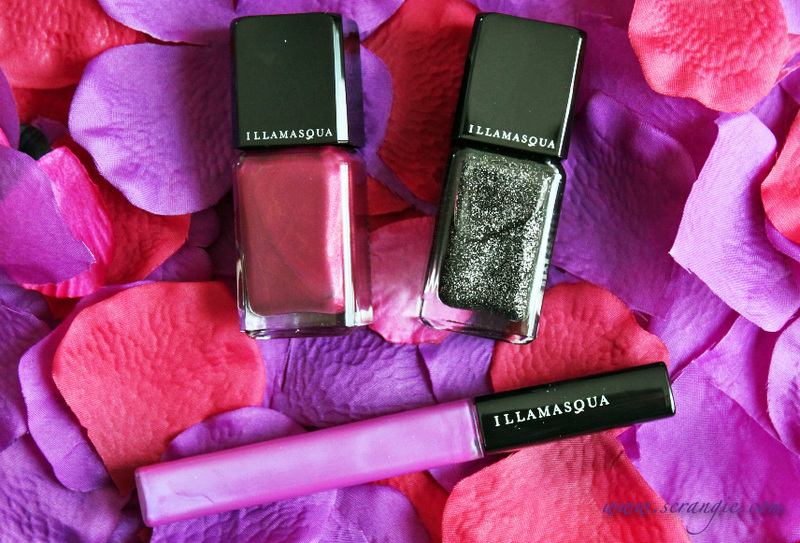 The Illamasqua Generation Q collection comes out today! It's a fairly big collection with a lot of new items, so you may want to check out the whole lineup on Illamasqua's website. While you're there, take a look at the amazing models they used for this collection! These models were chosen as a result of the Beauty Before Age contest, where the featured individuals were submitted by family and friends for a chance to star in an Illamasqua campaign. Pretty cool, right? I think so at least. I love seeing normal, genuine, everyday people in advertisements instead of the current trend of digitally reconstructed, completely unrealistic, airbrushed-to-death fantasy portrayals of humans. Anyway, I have the two new nail polishes from the Generation Q collection to review today: Charisma and Creator. Illamasqua Charisma. This is a pretty unusual color. It's a sort of cranberry verging on burgundy color- a medium wine red - but it has a strong flash of purple underneath it. It's like medium burgundy shimmer particles in a red-toned purple base. There are hints of gold in it as well. It's quite pretty and very fall-like without being the usual warm red or dark vampy wine type of fall color. I can't think of another polish I own that looks like this. Illamasqua Creator. This one is a small silver glitter in a black creme base. The glitter is small and somewhat irregular in shape. It's not perfect, round glitter particles. Because of the small size and flat shape of the glitter, this polish is surprisingly smooth. It doesn't need more than one coat of topcoat to achieve a glassy finish. The color itself is not unique- there are several black-with-silver-glitter polishes out there- but the nice formula and smooth finish of this is quite nice. The formula on each of these was different. Creator was thin (thinner than I'm used to with Illamasqua cremes), very smooth, very easy to apply. Charisma was a lot thicker and kinda foamy feeling. Creator gave me no problems at all but Charisma was a little tricky. Charisma wanted to get stringy and pool at the edges of my nail, creating bumps and ridges in my manicure. I think it would benefit from a few drops of polish thinner. Despite the differences in texture and application, both dried quickly. I like both the colors in this collection. Charisma is a unique color, but the formula isn't as good as I had hoped it would be. Creator has an absolutely perfect formula and it is an awesome color, but it's not entirely unique. I can't think of another polish that looks exactly like Creator, but I know there are several similar black with silver glitter colors out there (Orly Goth comes to mind). The Illamasqua Generation Q collection is available now on Illamasqua.com, but as of now it's not yet available at Sephora. I am loving both of these - glad to know the gray glitter looking one is smooth! Outstanding. Charisma is reminding me of some old (like 90's) OPI shades only with an updated shimmer formula to it. I would like to see this shade make a come back again. Wow they look pretty! 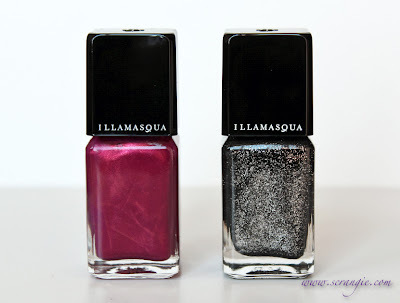 I just whish they would sell Illamasqua anywhere in Germany.. I love Charisma but I wonder how close it is to OPI Diva of Geneva. I had the pleasure of wearing both Charisma and Creator. Illamasqua knocked it out of the park with those! I do really love Creator, even if it reminds of a China Glaze similar one. Since I do not own myself the CG it would be a great opportunity to have it! I really love its finish!! I wish I could manicure like you, more practice needed. :) I was lucky enough to get Charisma a couple of weeks ago on a certain auction site and I was worried it wouldn't be a real one, but it is! I love it, you've made me want Creator now too! Wow, these are both gorgeous! I love Creator! I love them both but I NEED creator on my nails!